Just after mid-day, we checked into The Children's Hospital Denver. Tomorrow Max will undergo a planned surgery to address an anomaly in his transverse colon (aka large intestine). 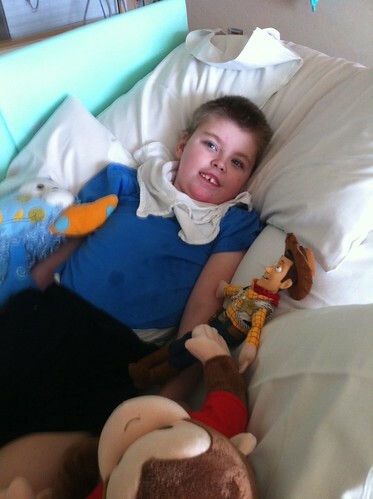 In December 2010, Max was admitted through the emergency department due to uncontrolled vomiting. In short order, his intestines became blocked and he required emergency surgery to resolve an intestinal blockage. At the time, there was not a clear answer of what happened but we were pleased for him to be better and make it home a few weeks later. In May 2011, we brought Max back to the emergency department because he was vomiting, not tolerating his feeds, and exhibited general stomach discomfort. An x-ray revealed his transverse colon was enlarged and twisted on itself resulting in a condition called a volvulus. An emergency colonoscopy was performed with a surgical team on standby to attempt to resolve the volvulus. A transverse colon volvulus is profoundly rare with on 14 previous medical cases published. Resolution via colonscopy does not appear to have previously been successful. Fortunately, the colonoscopy worked this time. The surgeon whom we have worked with multiple times suggested we give his intestines two weeks to settle down then go for an imaging study to get better pictures of what was happening inside. A barium enema was completed yesterday revealing an anatomical anomaly in his transverse colon. This anomaly is called chilaiditi syndrome. In retrospect, this may be the cause of the intestinal blockage that occurred in December '10 as well as the May '11 event. We can recall other previous unexplained vomiting episodes (cyclical vomiting) that are now suspect to us. Interestingly enough, a review of the literature finds hits for chilaiditi when searching for transverse volvulus. The illustration below shows the normal position for the transverse colon. 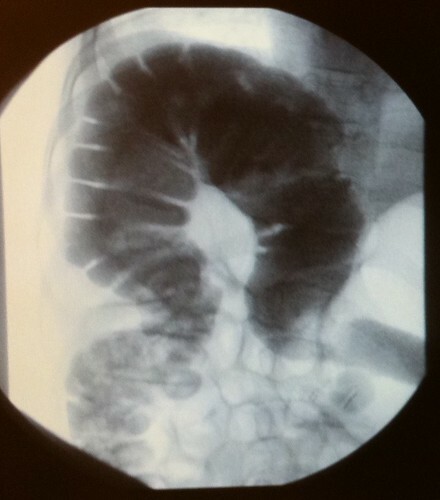 The image below is reveals Max's transverse colon. The dark horseshoe shaped section is his transverse colon. See any problems with that? Max will go in for surgery Friday morning. The plan is remove the horseshoe shaped section and attach the two ends (left and right) together to resemble the normal location and position of the transverse colon. No surgery is without risk. In December, Max experienced significant abdominal infection post-surgery. Our hope is that this will resolve the recurring intestinal issues and allow him a resumption of normal activities quickly. Check back often for updates. We will post additional information as we learn more. Max this afternoon...healthy, happy and ready for what's next. Love the pic! I'll be thinking of you guys tomorrow, hoping everything goes well, and recovery comes quickly! I hope the surgery is successful and the recovery is infection free! I love his smile, what a great photo! deana, our prayers are with you, steve and maxi.praying that he gets back home soon without any postinfection. sending hugs, love and positive thoughts your way, my friend! Will keep Max and all of you in our prayers for a smooth surgery and even smoother and quick recovery. What a lovely smile Max has! Praying for a speedy recovery. Eloise is very happy that he has Woody to keep him company! Just now seeing this. As always, deep, deep prayers.